Hyper allows to automatically charge all of the clients that have a credit card or a bank account details defined in the system (C.C. Log & S.O. tab in the Client Card). The system calculates the total amount of debt for each client and allows to run Bank Accounts/Credit Card Charges. This tab displays all of the clients that have any debt and can be charged via credit card or bank account details that were defined in the client's card. 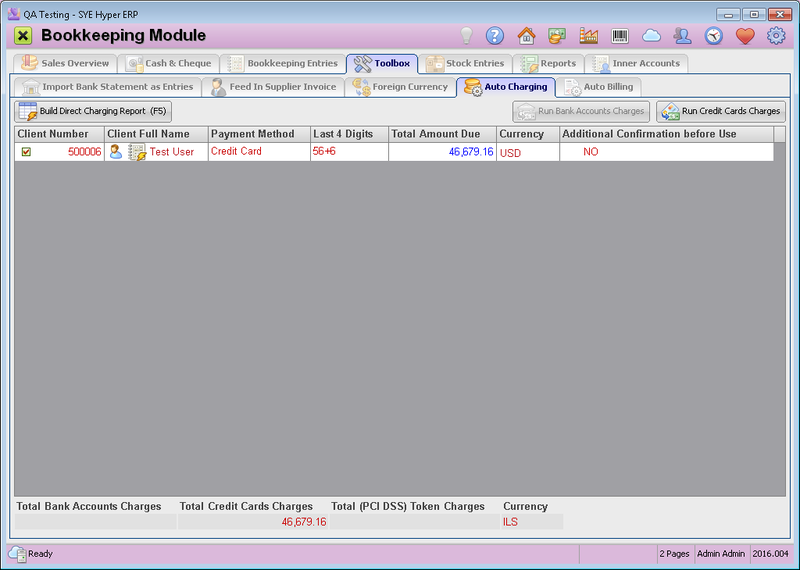 Each row in the table displays a client details, payment method and the total debt. The information fields at the bottom of the table display the total bank accounts charges and the total Credit Cards Charges. Press the Build direct Charging Report (F5) button, to display the clients that can be charged via the Credit Card or the Bank Account that were defined in the clients cards. Use the check boxes in the "Client Number" field to select the clients to charge. This button is available for clients with a defined bank account for auto billing. After choosing this option, the system allows to produce a receipt and will ask the user to approve it. This button is available for clients with a defined credit card for auto billing. The system will ask the user to approve the immediate charge and will produce a receipt for it.